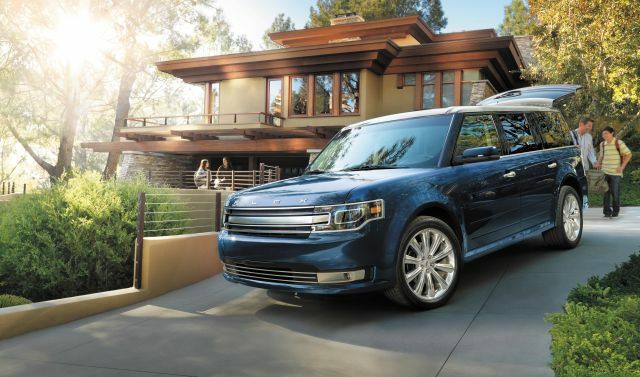 2017 Ford Flex May be the Last? 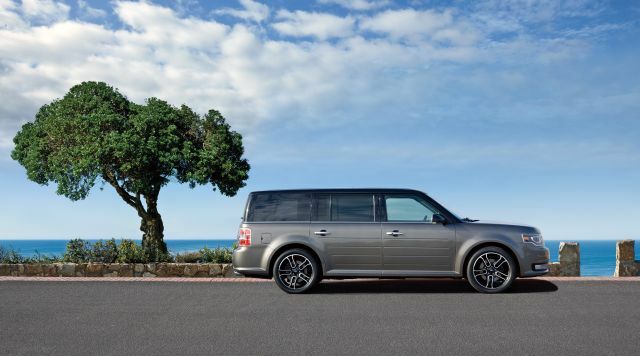 What changes will make 2017 Ford Flex different? Maybe a new color choice or two, an outside chance of added safety features. But the end is near for this odd duck. A low-set, three-row crossover, Flex was Ford’s brave attempt at a minivan/SUV mashup. Launched for 2009 with projections of 100,000 annual sales, the cumulative total through calendar 2015 was around 214,000 – and sales were down 17 percent for the year. The station-wagon-on-steroids styling proved a dud everywhere but California, where buyers looking to stand out embrace its quirky shape and snap up 25 percent of total production. To Ford, that’s an important presence in an import-dominated state. But it isn’t enough to stave off The Hooded One. Reports speculate the automaker will stop building Flex in late 2018, making ’18 or possibly 2019 its final model year. A wider color palette – “Too Good to Be Blue” was added for model-year ’16 – is not much of a reason to wait. It might, however, be worth holding off to learn whether Ford sees fit to upgrade safety features, adding things like automatic braking to mitigate frontal collisions and automatic steering to correct for traffic-lane wander. Without them, Flex can’t qualify for the top rating from the influential Insurance Institute for Highway Safety. Whether such a low-volume vehicle (Flex ranks last in Ford-brand sales) justifies even that investment, only Ford can decide. Otherwise, the ’17 should return with seats for six or seven, the option of front-wheel drive or all-wheel drive (awd), and a choice of two 3.5-liter V-6s; the one from Ford’s turbocharged EcoBoost engine family makes for a surprisingly quick brick-shaped crossover. Yes, if you’re drawn to exotic forms at mainstream prices. The ‘16’s overall styling and main features will be the same as the ‘17’s, but it’ll cost less. If not quite cutting-edge for safety items, the ‘16 is available with forward collision warning and blind-spot detection, plus the automaker’s laudable inflatable rear safety belts. Unlikely to change is the lineup. Expect a base SE model, volume-selling SEL, and upscale Limited. All come with front bucket seats and second- and third-row benches; second-row buckets are a $695 option for SEL and Limited. Those models also come with heated power front seats and the carmaker’s Sync 3 infotainment interface, a huge upgrade in user-friendliness over the glitchy MyFord Touch affair. A navigation system is standard on Limited and a $795 SEL option. Leather upholstery is also included on Limited and available on SEL as part of a $2,400 package that also includes a power liftgate. A multi-panel panoramic moonroof is a $1,595 option on both. Only if there are new colors. Carrying Flex to the end will be the minor appearance tweaks introduced for model-year 2013. They brought a suggestion of roundness to the vehicle’s corners and dumped the grille’s blue-oval brand insignia for “Flex” in block letters on the hood brow. But the original shape is as it was when Flex bowed for ’09, inspired, Ford admits, by that of the Mini Cooper. It’s a long, two-box affair with fine passenger room in the first two rows but a cramped, hard-to-access third row. Flex competes in the midsize-crossover class with the likes of the Honda Pilot, Toyota Highlander, and Ford’s own Explorer. It’s several inches longer overall than anything else in the segment, but its relatively low roofline keeps cargo volume comparatively modest. Still, those proportions set it apart, as do retro-flavored bodyside ribs and the popular contrasting-color roof paint, a $395 option. Likely to return for 2017, perhaps accompanied by a complementary dress-up option, is a striking $1,495 appearance package that adds black exterior accents that include a black roof and shadow-finished 20-inch alloy wheels. 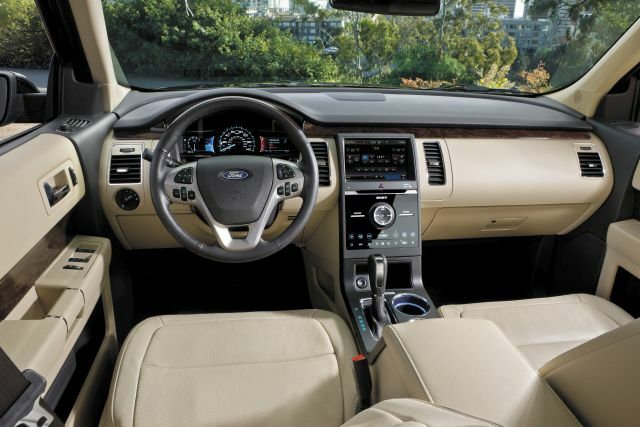 Inside, there’s a slim chance Ford will offer a fresh hue or a new finish on some surfaces. It won’t fully redecorate, leaving the ’17 Flex with a dated-feeling cabin made up mostly of 90-degree angles. Highly unlikely, though there’s always a chance the automaker could conclude demand for the EcoBoost engine option is so weak that it can’t reconcile its return. We hope not. The base V-6’s 287 horsepower and 254 pound-feet of torque provides merely serviceable performance. The EcoBoost V-6’s 365 horsepower and 350 pound-feet of torque is transformative, cutting 0-60 mph by some 2.5 seconds, to a highly entertaining 6 seconds flat. It’s essentially a $2,850 option exclusive to the Limited model and comes with uprated suspension and steering-wheel-mounted paddle shifters. The sole transmission with either engine will again be a 6-speed automatic. Look for the SE model to remain front-drive only, with awd a $1,950 extra exclusive to SEL and Limited and standard with the EcoBoost. With a carlike 5.9 inches of ground clearance, this is less an off-roader than even the typical crossover, although the awd system is calibrated to assist dry-road handling as well as slippery-surface traction. Flex’s lower center of gravity compared with traditional, higher-riding crossovers does benefit road manners. However, the Ford is still more ponderous-feeling than similarly sized but sportier SUVs such as the Pilot, and especially premium entries like the Audi Q7 and BMW X5. With no mechanical changes, 2016 EPA ratings should repeat. That would again situate Flex among the least fuel-efficient midsize three-row crossovers. Expect models with the base V-6 to again rate 16/23/19 mpg city/highway/combined with front-wheel drive and 16/22/18 with awd. The Limited with EcoBoost should return at 15/21/17 mpg city/highway/combined. Ford will likely continue to recommend premium-octane gas for the EcoBoost in order to get full performance and mileage. Adding automatic emergency braking and steering correction would bring Flex abreast with newer rivals for some of the latest safety tech. The ’17 will again offer adaptive cruise control that maintains a set distance from traffic ahead. It’s been included only in a $2,900 option package exclusive to the Limited; we’d like to see it made available at least on the SEL. Similarly, blind-spot detection with rear cross traffic alert has been standard on the Limited and optional on SEL as part of a $2,400 option group. The inflatable outboard rear safety belts are an aid for frailer bodies and have been a $195 SEL and Limited extra. If you choose to replace the rear bench with the buckets, we recommend ordering the accompanying center console. You’ll sacrifice the central pass-through to the third-row, but it’s the only way to give second-row passengers sorely needed inboard armrests. The console is a $150 option on the SE and, as a handy refrigerated unit, a $795 option on the SEL and Limited. Aside from the SE’s rental-fleet orientation, Ford positions Flex fairly upmarket. Added safety features would seem to appeal to its audience. That tiny but loyal following evidently doesn’t balk at adding options that can elevate prices to premium-crossover territory. Take, for example, a 2016 Limited with awd and popular options. The aforementioned $2,900 package (which also includes a heated steering wheel, cooled front seats, power tilt/telescope steering column, power-folding third-row, and automatic self-parallel-parking), plus the $1,495 Appearance Package had it stickered at $45,040. Spring for the EcoBoost version similarly outfitted and you were looking at $47,885. Count on base prices climbing a few hundred dollars, maybe more if some previously optional equipment is made standard. (Our estimated base prices include Ford’s destination fee, which was $895 on the 2016 Flex.) Expect the SE to begin around $30,600, the SEL around $33,600 and the Limited around $38,995. To that, figure adding $1,950 for awd. Look for the Limited EcoBoost to be priced from around $43,800. We urge Ford to update Flex with the latest safety features. And please, fit those second-row buckets with inboard armrests. Little fold-down perches would be fine. That way, owners who don’t want the rear center console could make second-row passengers more comfortable, give them something to brace against during turns, and preserve the center pass-through to the third row.